This Brazilian-American coproduction is a cleverly constructed documentary about the proliferation of violence in the Brazilian city of San Paolo. With a population of over 20 million, the gap between the rich and the poor has incited corruption amongst politicians and kidnappings amongst those less fortunate. We follow a number of stories concurrently - a woman who had both hear ears cut off during a kidnapping and the plastic surgeon who restored them, a wealthy businessmen's tireless efforts protect himself from crime, a corrupt politician who continues to maintain his innocence and a kidnapper who moved from the poorer rural areas of Brazil to San Paolo in search of wealth. These threads are bound by the investigation of a frog farm, something pivotal to those in power but of which no one wishes to speak. Producer and director Jason Kohn cleverly interweaves this material, employing slick graphics and deft editing to strengthen material which was already inherently powerful. There is barely a shot that relies on a typical setup - even though he most of his interviewees sit beside their interpreters, Kohn shoots them in erratically framed close and medium shots to the tune of pulsating Brazilian pop. Despite most speaking Portuguese, much of the film is edited to be in English, clearly a clever ploy to its target audience. 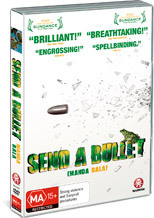 In an effort to be entertaining, however, Send a Bullet ultimately doesn't bring together its disparate strands into a singular thesis. Yes, the give-and-take of crime and violence between the upper and lower classes is prevalent and a serious issue, but what can be done to improve the situation? Kohn, who has previously worked with Errol Morris, is undoubtedly talented, but here he brings little of his perspective beyond a distinctive visual style. Nonetheless, Send a Bullet is an entertaining documentary that sheds light on a problem likely not known to many outside Brazil. This madman DVD release contains both a Dolby 2.0 and 5.1 audio track, deleted scenes and an audio commentary by Kohn and fellow producer Jared Goldman.